I chose these Edelbrocks to look like the original spinner hubcaps.....not a bad look! 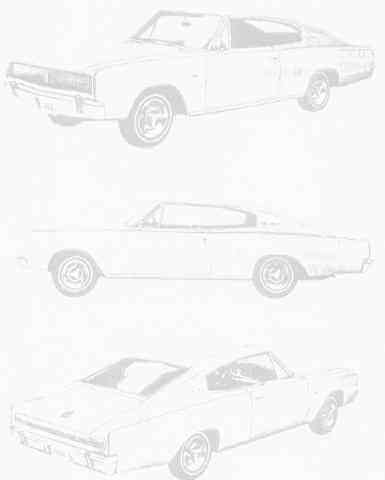 I love the white walls as they remind me not so much of the muscle car image, but of the advertisements from Dodge in '66. Nothing beats a set of wheels that came with our Chargers. Now that money grows on trees here is my Choice I couldn't afford back in 1966 . I got the Magnum 500 rims with Coker redline radial tires. The cost was $397.70 per wheel including rubber, valves and chrome lug nuts with the proper threads. Although they never came this way from the factory, mine has body color rims, 15x8's from a late model imperial and plain Dodge dog dish hubcaps. When I got my 66 Belvedere with the stock 10" drum brakes it had 15 x 7 Mopar police car wheels on it. When I took off the front wheels I wondered why they had washers on the brake drums under the wheels. I found out why when I tried to put the wheels back on without the washers. The balance weights on the inside of the wheels hit the upper control arms. Now that I've converted to disc brakes they fit fine. The police car wheels also fit my Charger with no problem but it has the larger and wider hemi 11" drum brakes. BTW the true wheel width is measured between the inside beads that the tire goes up against not the outside edges of the rim. If they are stock Mopar wheels the size should be stamped on the inside of the rim.